Will Smith and Tom Holland team up as super spy Lance Sterling and scientist Walter Beckett in upcoming animated film Spies in Disguise! Watch the first trailer. Friends, 2019 is going to be such a fun year for movies. While I’m looking forward to seeing Will Smith as Genie in the live-action Aladdin (out May 2019, watch Disney’s first look trailer HERE), as well as Tom Holland in Avengers 4 (whatever it’s called and whenever it’s coming out, OMG), there are a several other films coming our way. 20th Century Fox just released the first trailer and official poster, and character posters for their upcoming film Spies in Disguise, an animated comedy set in the high-octane globe-trotting world of international espionage starring Will Smith and Tom Holland. Audi brings futuristic design and mobility to the big screen for the first time with the Audi RSQ e-tron, a fictional, virtual performance concept car created specifically for this film! The full-battery electric model, created by Audi Design in cooperation with Blue Sky Studios, combines automated driving with artificial intelligence and transformational technology. The RSQ e-tron will be driven by super-spy Lance Sterling, voiced by Will Smith, and appears in the film’s trailer, which you can watch below. Super spy Lance Sterling (Will Smith) and scientist Walter Beckett (Tom Holland) are almost exact opposites. Lance is smooth, suave and debonair. Walter is… not. But what Walter lacks in social skills he makes up for in smarts and invention, creating the awesome gadgets Lance uses on his epic missions. But when events take an unexpected turn, Walter and Lance suddenly have to rely on each other in a whole new way. And if this odd couple can’t learn to work as a team, the whole world is in peril. SPIES IN DISGUISE is an animated comedy set in the high-octane globe-trotting world of international espionage. 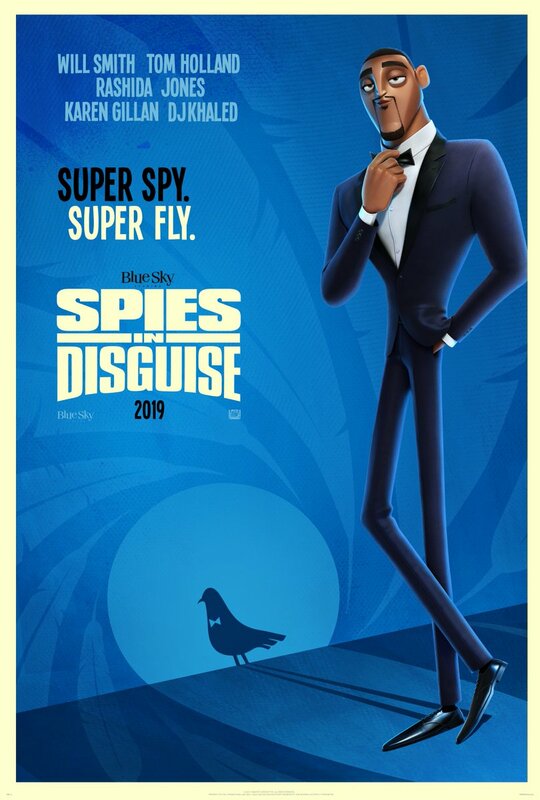 Check out the new posters and make sure to stay tuned to Spies in Disguise social media for the latest updates!